The Community Development and Knowledge Management for the Satoyama Initiative Programme (COMDEKS) was launched in 2011 to support local community activities that maintain and rebuild target production landscapes and seascapes, and to collect and disseminate knowledge and experiences from successful on-the-ground actions so that, if feasible, they can be adapted by other communities throughout the world to their specific conditions. The programme provides small-scale finance to local community organizations in developing countries to support sound biodiversity and ecosystem management as well as to develop or strengthen sustainable livelihood activities planned and executed by community members themselves. The target landscape for COMDEKS activities in El Salvador, the Conservation Area Jiquilisco Bay - Bajo Lempa - Jaltepeque Estuary, is located on the central Pacific coast of El Salvador between the coastal departments of La Paz, San Vicente and Usulutan. The target landscape for COMDEKS activities in El Salvador, the Conservation Area Jiquilisco Bay – Bajo Lempa – Jaltepeque Estuary, is located on the central Pacific coast of El Salvador between the coastal departments of La Paz, San Vicente and Usulutan. Jiquilisco Bay and the Jaltepeque Estuary are the country’s most important ecological corridors. Together, they occupy an area of 112,454 ha. Bajo Lempa is a coastal plain—one of the four geomorphological regions (namely, the northern mountain range, interior valley, quaternary volcanic range, and Pacific coastline) found in El Salvador. This geomorphological region is composed of four isolated bands, which collectively cover about 13 percent of the country and are mainly characterized by flat relief with an average decline of 1 percent. It is located on the plain at the center of the country, bordered to the east by the Sierra del Balsamo, to the west by the Sierra de Jucuarán, and to the north along the foot of the volcanoes of San Vicente, Stool, Usulutan and San Miguel. The Jiboa and Lempa rivers are the major contributors to movement of sediment in the plain. Jiquilisco and Jaltepeque lie at the mouth of the Bajo Lempa delta flowing into the Pacific, and comprise wetlands, coastal plain estuaries, intertidal mud and sand, sandy beaches, mangroves, seasonally saturated forests in Escuintla, Taura and Nancuchiname, as well as shallow marshes in and around El Aguaje. The Lempa River flows through Guatemala, Honduras and El Salvador. Consequently, land use requires international agreement and compliance with the agreements relating to the utilization of international river basins. The demands on water resources in El Salvador are multiple, hence the complexity of its water management for direct consumption, irrigation, industrial use and even hydropower generation through reservoir regulation. The target landscape is composed of a diverse mosaic of ecosystems, including agro-, coastal, marine, and natural forest ecosystems that extend some 10 km inland. Land use ranges from the conservation and sustainable use of mangroves in the coastal area to the production of shrimp, coconuts, sugarcane, livestock (on a small scale), fruit, basic grains, and vegetables in some of the wetlands. Due to their vulnerability and because they are an important nesting area for many endangered bird species, the Jiquilisco Bay and the Jaltepeque Estuary were declared as protected sites by the Convention on Wetlands of International Importance (Ramsar). In 2007, Jiquilisco Bay was further declared a UNESCO biosphere reserve (the Biosphere Reserve Xirihualtique). It is estimated that along its 37 km of beaches can be found nearly half of the 300 Carey tortoises known to live between Mexico and Peru. This area also hosts the largest abundance of coastal and marine birds in El Salvador, including a number of threatened or endangered species. More than 80 species of migratory birds visit this area to feed on Jiquilisco Bay’s plentiful fish, which include species such as red snapper, snook, and corvina. The target landscape comprises a considerable number of scenic spots and historical sites of special ecological value with high tourist and recreational potential, particularly in the Bajo Lempa River Basin and the western edge of the Biosphere Reserve Xirihualtique – Jiquilisco. Large El Salvadorian forests rich in biodiversity reach into this region, containing a number of species that are difficult to see in other parts of the country. These include crocodiles and resident and migratory shorebirds. The area further provides multiple ecosystem goods and services, some of which could generate revenue to subsidize the costs of conservation and generate local income. These include rural ecotourism, carbon sequestration, reduction of vulnerability to natural disasters, water production, fisheries and aquaculture, sustainably produced wood and nontimber forest products, and certified sustainable agriculture and biodiversity conservation activities. The Conservation Area Jiquilisco Bay – Bajo Lempa – Jaltepeque Estuary has a population of at least 25,000 inhabitants, many of them poor. The Human Development Indices (HDI) in the municipalities of the target landscape are lower than most other areas in El Salvador (0.677 in San Luis La Herradura, 0.685 in Jiquilisco, and 0.717 in San Vicente (2009)). Most communities’ livelihoods depend on subsistence activities. In general, most people do not own the land they live on, but rent it year by year for the cultivation of basic grains, or survive on coastal and marine activities. The size of individual agricultural plots ranges from 0.2-2.8 ha, but some communities have established cooperatives to combine plots into larger fields for the cultivation of sugar cane. The basic organizational structure in communities in the Conservation Area allows for civil society participation in environmental and natural resource management activities as well as community development. It gives authority to local communities to negotiate rights and responsibilities, and creates a basis for promoting community management of the Conservation Area, indicating a progressive level of local environmental governance. The local population actively promotes interagency coordination based on their historical links as communities, political ideology and shared experiences. They often have a clear vision of community development, including the conservation of natural and cultural heritage of the environment and its inhabitants. In part, this stems from previous involvement with SGP projects in the area. Noteworthy programs on sustainable management of resources in the target landscape include establishment of crab nurseries, community management plans of coastal and marine resources, community policing units and coordinated risk management. Land use changes, traditional practices of shifting agriculture, pressure on mangrove ecosystems, and pollution of soil and water are some of the factors limiting the quality of life of communities in the area. During the rainy season, the area is affected by floods from overflow of the rivers Lempa and Jiboa that degrade ecosystems and cause riparian forest loss. Deforestation and biodiversity loss: High levels of deforestation caused by fires, overgrazing of livestock, agricultural expansion, fuelwood and timber extraction, and illegal occupation of land by migrants from elsewhere in El Salvador have resulted in the loss of significant forest and scrub habitats, affecting local biodiversity. The introduction of crops and tourist infrastructure threatens freshwater supplies and mangrove forests. Loss of aquatic biodiversity: Exploitation of marine and coastal resources through inappropriate fishing practices of shellfish and Curileo has increased in recent years. Particularly harmful to aquatic biodiversity are the use of trawls. Resource loss and environmental degradation: The local economy is based on activities that damage natural resources. Subsistence and livestock farming have expanded to lands not suitable for these activities, causing overexploitation and degradation of the soil, which in turn drives people to expand even further into new areas, including protected areas. Furthermore, soil and water contamination by the indiscriminate use of chemical fertilizers and pesticides affects human health and the reproductive cycle of many marine species. Governance issues: Delayed policy response by governments to local proposals to implement environmental conservation activities is slowing down efforts by local civil society organizations, which are pushing for more involvement in policy formulation. Furthermore, uncertainty over land tenure has already caused conflicts over land and resources within local communities. Financial constraints for environmental management initiatives: Despite the high demand by local communities to improve environmental and natural resource management, support for conducting studies on the valuation of ecosystems and developing mechanisms to involve users of ecosystem services in their conservation is insufficient. Capacity and infrastructure constraints for developing sustainable tourism services: Despite a large potential for and interest in ecotourism activities, communities and local industries lack the technical and managerial capacity, experience, and financial resources to implement competitive and sustainable tourism projects. The local population perceives the current industrial tourism developments as a threat to the environment and local socioeconomic conditions for communities. However, infrastructure in rural areas is mostly insufficient to meet visitor expectations, including water and sanitation facilities. Cooperation among tourism entrepreneurs, local governments and civil society will be necessary to establish such infrastructure in a sustainable manner. In order to assess baseline conditions in the target landscape and identify opportunities for community action in a participatory manner, community consultations with 27 stakeholders were conducted in February 2014. The nine target communities identified for the COMDEKS baseline assessment were selected based on the methodological approach used by GEF SGP El Salvador. This approach considers the local use of environmental goods and services provided by different ecosystems, and the potential to improve the local educational level, implement key components for sustainable long-term development, promote human development, strengthen local capacities and promote integration of women and youth in the community development process. Five workshops, each with 25 participants, were convened, consisting of local leaders and civil society groups. These were facilitated by the National Coordinator of the GEF Small Grants Programme to share the vision and approach of the Satoyama Initiative and outline experiences and best practices from GEF SGP projects in the target landscape in recent years. Participants were able to identify and communicate increased pressures on natural resources affecting their livelihoods. Using the SEPLS indicators, workshop participants evaluated local issues such as protection of ecosystems and preserving biodiversity; agricultural biodiversity; knowledge, learning and innovation; and social equity and infrastructure. The results from the community consultations and workshops for the baseline assessment determined the design of the COMDEKS Landscape Strategy for El Salvador. To execute the strategy, local Community Development Associations (ADESCOs) were provided technical assistance and funding to implement projects to improve livelihoods and facilitate community capacity building. The Landscape Strategy aims to strengthen systematization of processes, technology validation and management of natural resources in ADESCO projects, and share successful strategies and methodologies through experience exchange, knowledge fairs and distillation of lessons learned. Table ES-1 illustrates the four specific Landscape Resilience Outcomes, along with key performance indicators to measure progress toward these Resilience Outcomes. The provision of ecosystem services in the landscape is improved through local actions for conservation and sustainable use of natural resources. · Hectares of marine and terrestrial ecosystems in various stages of regeneration and recovery. · Hectares of marine and terrestrial ecosystems managed using sustainable production practices. · Percentage of local ecosystems managed by individuals, local civil society groups and ADESCOS interested in increasing the resilience of the landscape. Agricultural productivity is improved in the target landscape through the promotion of sustainable agricultural practices, resulting in greater food security and income generation. · Number of hectares protected and conserved through sustainable agricultural practices in watershed recharge areas. · Number of women and men participating in soil improvement practices and sustainable land management. Options for alternative livelihoods are promoted within the landscape, increasing access to markets and local financial institutions. · Number of men and women who benefit from the project activities. · Number of income-generating livelihoods created and percentage of increased household income attributable to project activities. · Number of communities demonstrating sustainable land use practices and good management of natural resources. Institutional capacities of local organizations are strengthened, promoting the exchange of knowledge and information on the efficient use of natural resources and facilitating participatory decision making about landscape management. · Number of policies developed at the community level for the sustainable use of biodiversity resources and the application of best practices for sustainable agriculture. · Number of case studies of best practices developed at the community level. · Share of governance systems effectively managed by individuals, local groups and landscape-level ADESCOs. Facilitate integrated management plans for freshwater basins and coastal areas to address the causes and sectorial activities that endanger mangroves, which serve as nurseries for the living resources of the ocean. Promote sustainable use of rangelands by strengthening viable traditional systems; developing mechanisms for resolving conflicts over land use; protection from and management of fires as well as rehabilitation of burned land; and developing groundwater recharge initiatives. Promote management and recycling of solid waste. Document local knowledge of traditional and sustainable practices of natural resource use from terrestrial, coastal, and marine ecosystems. Based on this guidance, nine local projects were selected for El Salvador’s portfolio of COMDEKS projects in the target landscape. These projects each focus on a specific subregion and are led by the respective local development associations (ADESCOs) of the different communities. However, all nine projects consist of very similar activities. Proposals were evaluated by the El Salvadorian National Steering Committee of the GEF Small Grants Programme and approved for grants between US$25,000 and US$50,000. Restore 40 hectares of mangroves and reforest the riverbanks of the Jalponga River to avoid flooding and generate grazing land for livestock. Facilitate continued community monitoring of local biodiversity. Increase agricultural biodiversity for 10 local families through cultivation of native corn and pumpkins. Establish 15 chicken-rearing enclosures to increase income and decrease environmental impacts of livestock. Decrease consumption of firewood through introduction of socially appropriate technologies (SAT), such as Magic Kitchens, Rocket Stoves and solar ovens. Establish wood lots for fuelwood production. Conserve and promote the sustainable use of fishery resources, including punche, jaiva, shells, mica, sambo, hilama, guavina, chimbera, catfish, snapper, snook, roncón, pancha, grouper, and shrimp. Build the capacity of 40 families in shellfish aquaculture, establishing 5 nurseries to raise blue crabs. Help local fishers group to acquire 10 fiber canoes. Increase agricultural biodiversity for 5 families through cultivation of traditional crops such as native corn and pumpkins. Strengthen capacities of 10 community members in hammock production. Establish 260 local palm nurseries. Introduce socially appropriate technologies (SAT) to 16 families, with one Magic kitchen and Rocket Stove, as well as solar ovens for each family, while establishing fuelwood lots and decreasing consumption of firewood. Contribute to the restoration of 40 ha of mangrove forest and 3 km of riparian forest along the Jalponga River. Ensure the protection of local ecosystems and the sustainability of local food security. Establish 20 enclosures for chicken-rearing. Introduce SATs for cooking to 11 families. Promote the sustainable use of local fish and shellfish resources. Assist local fishers to acquire 20 fiber canoes and strengthen capacities of 20 community members to manufacture fishing nets. 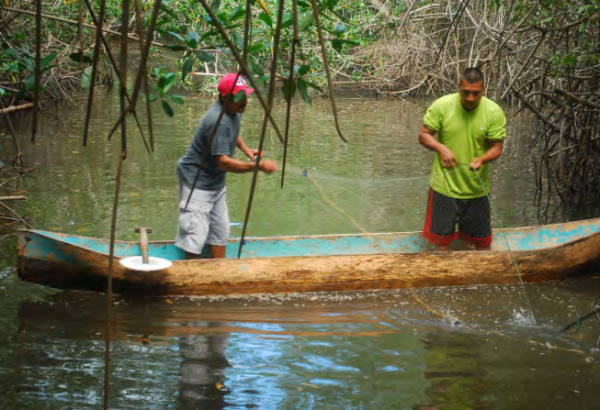 Restore mangrove and riparian forests in the Jaltepeque Estuary. Establish 10 blue crab nurseries, and establish local fisheries management plans for punche, jaiva, shells, mica, sambo, hilama, guavina, chimbera, catfish, snapper, snook, roncón, pancha, grouper, and shrimp. Establish woodlots for fuelwood production. Cultivate traditional crops such as wild pineapple and creole corn. Establish 10 enclosures for chicken production. Introduce SATs for energy efficient cooking to 10 target families. Improve ecotourism infrastructure to reduce the environmental impact of the tourism industry. Contribute to the reforestation, preservation, and monitoring of 40 hectares of mangrove forest in the Jaltepeque estuary and 3 kilometers of riparian forest along the banks of the Jalponga River. Establish local fisheries management plans for coastal and marine resources, including punche, jaiva, mica, sambo, hilama, guavina, chimbera, catfish, snapper, snook, roncón, pancha, grouper, shrimp. 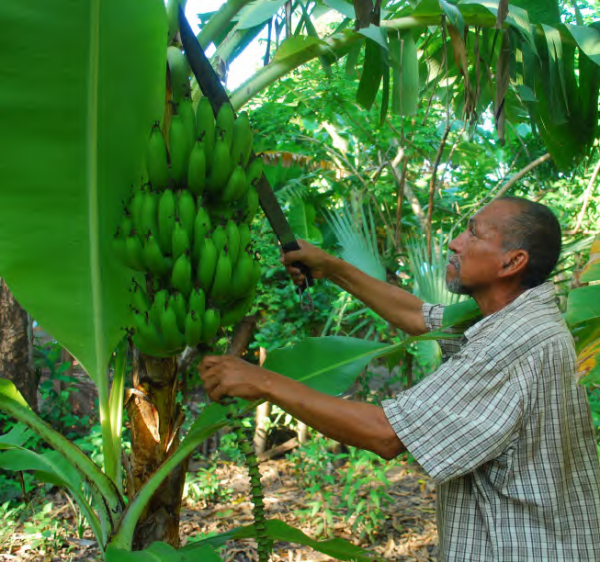 Cultivate traditional crops such as palma, madrecacao, and creole corn. Strengthen capacities in subsistence gardening and handicrafts. Introduce SATs for energy efficient cooking to 10 target families. Establish woodlots for fuel wood. Improve local SEPLS by conserving marine and terrestrial biodiversity. Strengthen local ecotourism infrastructure through formation of a tourism committee and establishment of a location for seafood tasting. Introduce SATs (Magic Kitchens, Rocket Stoves, and solar ovens) for energy-efficient cooking to 22 families. Establish woodlots for fuelwood production. Encourage sustainable agricultural practices. US$25,000 Outcomes 1, 2, 3 and 4 Strengthen community capacities to sustainably manage coastal, marine, and terrestrial resources. Contribute to local mangrove restoration by helping 40 families to collect mangrove propagules (chuyas) and establish nurseries for raising them for subsequent planting. Also, promote monitoring and surveillance of mangrove forests. Introduce SATs for energy-efficient cooking to 14 families. Establish woodlots for fuelwood production. Strengthen ecotourism infrastructure. US$25,000 Outcomes 1, 2, 3 and 4 Improve marine resources management by implementing fishery management plans for coastal species such as jaiva, mica winter, sambo, hilama, guavina, chimbera, catfish, snapper, snook, roncón, pancha, grouper and shrimp. Establish aquaculture facilities to raise shellfish such as Ajalin, Anadara tuberculosa, and Anadara grandis. Cultivate traditional organic crops such as creole corn. Strengthen infrastructure for ecotourism. Strengthen local capacities to produce handicrafts and fishing nets. Introduce SATs for energy-efficient cooking to 11 families, while planting woodlots for fuelwood production. US$25,000 Outcomes 1, 3 Promote sustainable agricultural practices and diversify agricultural products by cultivating traditional crops such as creole corn, vegetables, pineapple, pumpkin, and fruit trees. Help 17 families to decrease their fuelwood consumption and relieve pressure on local forests through the introduction of SATs for energy-efficient cooking, while also planting woodlots for fuelwood production. More than 2,460 people (about 492 families) participated in the nine projects in the target landscape. The results of these projects added to and were magnified by other SGP projects supported in the area that were designed to achieve similar sustainable development goals. Conserving and restoring mangroves and gallery forests: Each of the COMDEKS projects is directly linked to mangrove conservation as a basis for the sustainability of activities in the coastal marine ecosystem. 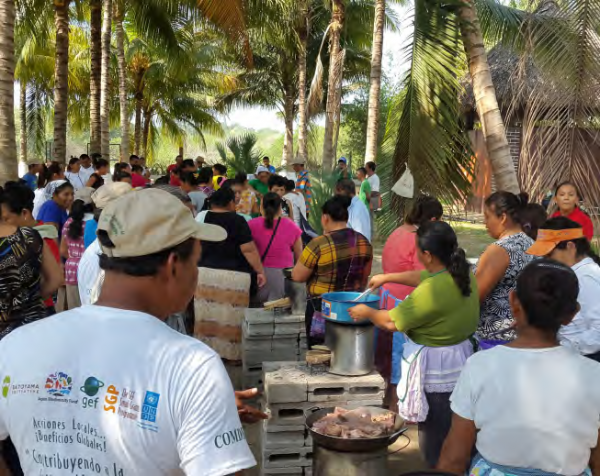 Through planting and restoration activities of some 440 families, the area of mangrove coverage has increased by 760 hectares, 400 in Jaltepeque Estuary, and 360 in Jiquilisco Bay-Bajo Lempa. This has involved collecting mangrove propagules, raising them in nurseries, and planting them out in estuary and shoreline areas. In the area’s gallery forests and riverbanks, communities have planted more than 19,000 trees of different native species. Together, these efforts have helped to mitigate the flooding that has plagued neighboring communities during the rainy seasons in the past. Practicing sustainable agriculture, resurrecting traditional crops, and converting to organic agriculture: Nearly 160 families now use sustainable agricultural practices, including 67 who have converted to organic agriculture. Sustainable practices include planting home gardens, raising poultry in fenced areas, as well as planting traditional crops such as creole corn, pineapple, pumpkin, and a local variety of cacao. Conversion to organic agriculture has started the lengthy process of purging or “decontaminating” local soils of chemical pesticides and fertilizers. Improving local fisheries management: Through a combination of training in sustainable fishing practices, creation of management plans for local fisheries, establishment of extensive shellfish farming, and purchase of new fishing equipment, fisheries management in the area has greatly improved. As a result, fishery production has risen, with the availability of blue crab, punche, jaiva, shells, mica, sambo, hilama, guavina, chimbera, catfish, snapper, snook, roncón, pancha, grouper, and shrimp increasing considerably. The 45 local fishing families that are participating in these sustainable practices are well aware of the benefits of this behavior change on their livelihoods. Promoting sustainable energy options: In partnership with the Chilean NGO Canelo Corporation, some 160 families in the area of Jaltepeque Estuary and 90 families in the Jiquilisco Bay-Bajo Lempa area took part in training workshops to build, use and maintain socially appropriate technologies for energy-efficient cooking. These technologies (Magic Kitchens, Rocket Stoves, and solar ovens) are meant to decrease the amount of fuelwood families use for cooking. In addition, these families also planted hedgerows and woodlots specifically to produce fuelwood, thus creating a more sustainable fuelwood supply. Together, these steps have eased the pressure to overharvest local forests. Strengthening local tourism: Five communities (54 families) have taken steps to establish tourism as a viable income source in the area by receiving training in providing tourist services such as mangrove tours, lodging, meals, and local crafts. Tourist infrastructure has been improved through the construction of lodgings, docks, and boating facilities. In addition, a Tourism Committee has been established to coordinate infrastructure improvements, tourism training, and to facilitate advertising and service coordination. Developing local handicrafts: Over 40 families have been trained in production of local handicrafts, including fishing nets and hammocks. Conducting project monitoring and evaluation: Each of the projects has created a local youth team for M&E. These teams have enabled communities to collect project development information in real time. COMDEKS projects, and the methodological approach of the Satoyama Initiative, have greatly strengthened the capacities of the local community development associations (ADESCOs) in four key areas: the ability to restore mangrove forests as a primary ecosystem generating many of the livelihoods in the area; the ability to reform local agriculture so that it is both more valuable for subsistence and less polluting and destructive of coastal productivity; the ability to restructure local fisheries management and create new sources of livelihood such as ecotourism and handicraft production; and the ability to preserve local ancestral knowledge related to agriculture and fishing. Since each of these activities was approached on a regional basis, with very similar projects in each community, it presented a good opportunity to develop a landscape community through regular meetings and communication among project representatives. Each community meets once a month to review project activities, and these meetings are frequently the venues for discussing and documenting traditional knowledge as well. Then the leaders of the nine different communities also meet monthly to coordinate and communicate about their projects. The nine communities involved in COMDEKS are also in communication with 10 additional communities in the target area that have received funding for similar projects—using the same general landscape approach—under the GEF SGP STAR program, thus enlarging the size of the landscape community. Working with a community that has previous experience in project implementation increased the effectiveness and success of COMDEKS activities in the target landscape, facilitating the learning process in other communities. This was the case with ADESCOCASAL, a community development association that had previous experience with the El Salvador SGP Country Program. ADESCOCASAL acted as a local development advisor to COMDEKS communities through the use of a multipurpose center, development of workshops and peer-to-peer capacity building. The COMDEKS projects built on the relationships with local community development associations (ADESCOs) that had already begun under previous SGP programming. Working with the leaders and directors of the ADESCOs promoted trust, eased the implementation process, and helped to ensure the equal participation of women, men and youth in all of the project activities. It was also crucial in ensuring the recovery of ancestral knowledge from elders of the communities. COMDEKS activities result in a positive social cycle. Continuous capacity building through project activities nurtures the social fabric in communities and improves local governance, while project results reported from the field build confidence in local leaders.